Svetlana exits her plane after a show. Kapanina was born on December 28, 1968 in Shchuchinsk, Kazakhstan. And, now at 50, she remains active in the European and American Air Show circuit. She dedicated herself to a number of different sports at school and always enjoyed motorcycles – and other motor vehicles, as well. She enrolled at medical school in Tselinograd, where she graduated in medical support sciences. She started flying at 19, in 1988, in a Sukhoi Su-26M3, (see below right) while working as a technician at the Kurgan Sports Aviation Club. The Sukhoi S-26M in which Svetlana learned aerobatics. By 1991 she was already an instructor pilot at DOSAAF‘s (Volunteer Society for Cooperation with the Army, Aviation, and Navy) Irkutsk Club, and then went back to Kurgan. In 1991, she became a member of the Russian national aerobatic team. In 1995 she graduated from Kaluga Aeronautical Technical School. She is now lives in Moscow with her husband and two children. 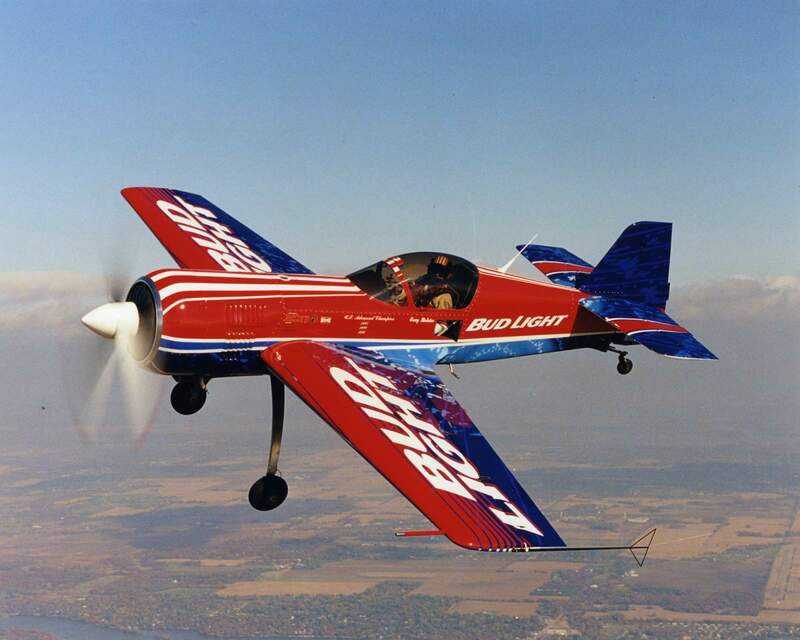 in aerobatics Kapanina was World Aerobatic Champion in the women’s category in 1996, 1998, 2001, 2003, 2005, 2007 and 2011 and has won the title more times than any other pilot in that (women’s) category. In addition, she was overall World Air Games Champion in 1997 and 2001. Together with Mikhail Mamistov and Oleg Spolyansky, she won the team gold medal in the 16th FAI European Aerobatic Championships in 2008 in Hradec Králové (Czech Republic). She placed fourth overall and was best female participant. In 1997, she received the Paul Tissandier Diploma by the Fédération Aéronautique Internationale (FAI). In 2005 she was awarded the Sabiha Gökçen Medal and the Centenary Medal by the FAI. 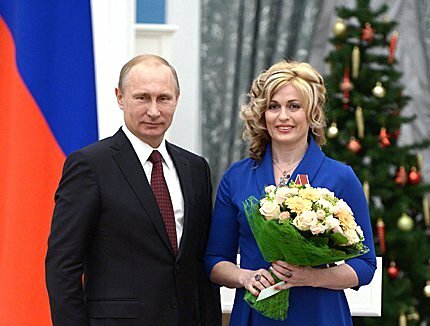 She was awarded Russia’s Order of Courage by President Vladimir Putin on December 22, 2014 (see photo immediately above to the left), just 6 days before her 46th birthday. Watch Svetlana run through one of her Airshow routines over her home country, after greeting the crowd over the loudspeakers. This video is about 17 minutes long. Turn your sound up and go to full screen to fully appreciate the excellent high-resolution videography. And also, below, watch her airplane cavorting through the sky with her hallmark precision in one of her World Aerobatic Competitions. You will witness Svetlana performing some extremely difficult manuevers with astounding accuracy. It’s a short clip, only 3:57 in length. Like an accomplished Prima Donna ballerina, this woman aviator may make these manuevers look easy, but they are, as you might expect, extraordinarily difficult – often involving Svetlana pulling fairly severe positive and negative “G’s” (Gravity Forces). This entry was posted in AVIATION NEWS, HOT NEWS!, NEW VIDEOS and tagged Air Show, Airshow, Ballerina, Czech Republic, DOSAAF, FAI, Gold Medal, High Resolution, Hradec Kralove, Irkutsk Club, Jurgan Sports Aviation Club, Kazakhstan, Mikhail Mamistov, motorcycles, Naional Order of Courage, Oleg Spolyansky, Paul Tissandier, positive and negative G forces, precision aerobatic maneuvers, Russia, Sabiha Gokcen, Shchuchinsk, Sukhoi S-26M, Svetlana Kapanina, Video, Women's International Aerobatic Champion, World Air Games Champion on November 11, 2018 by FASFRIC.